Clive Sinclair is a British electronics genius. He founded his company in the early 1960s and introduced very innovative micro radios and audio equipment. In 1972 he amazed the world with the Sinclair Executive calculator which was only 9mm (0.4") thick and ran off button cells. 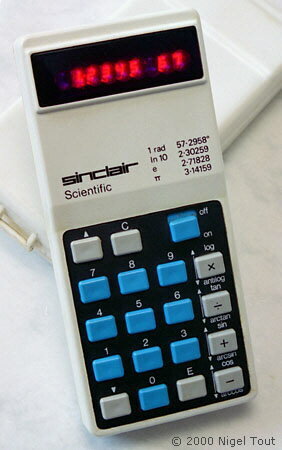 A range of calculators followed, but Sinclair left the calculator business in 1979 to concentrate on other products, such as the home computers and micro-televisions. See the article "Clive Sinclair and the Pocket calculator" in the Collecting Calculators section of this site. For details of most other Sinclair calculators go to the Sinclair section on the associated Vintage British calculators site. Launched in the summer of 1972, the Executive was the first Sinclair calculator, and by a clever circuit design was the world's first calculator to be powered by button cells. This allowed it to be incredibly thin for the time at 9mm, 0.4". The first Sinclair Cambridge model was introduced in summer 1973. There followed a range of a dozen or so models and variations. This is featured on the associated British Vintage calculator site. By a clever choice of algorithms and elctronics Sinclair was able to produce a very small, low-cost, Scientific calculator, using RPN (Reverse Polish Notation). There are several models in the Oxford range, and some were made in an LED version and also, probably later, in a VFD (Vacuum Fluorescent Display) version. These are featured on the associated British Vintage calculator site. By 1976, with the market flooded by many cheap models, Sinclair was struggling to make a profit from its calculators. The Sovereign was one of the last Sinclair models, and was a move by the company to a very stylish, tiny, high-quality model that it could sell for a higher price. This was one of the last calculators designed under Clive Sinclair, in 1977. For further photographs of Sinclair calculators see the Calculator Photo Library on this site.